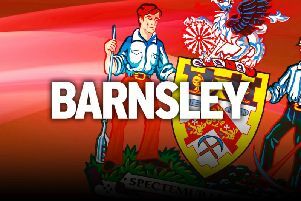 Barnsley have been dealt a big blow with both Marley Watkins and Josh Scowen set to leave the club. The sought-after pair rose to the challenge of Championship football, after being pivotal cogs in the Reds’ double Johnstone’s Paint Trophy and play-off success last season. However, after impressive campaigns in the second tier of English football both players look destined for the exit door at Oakwell. The dynamic duo have been locked in contract talks with the club for some time, with both of them said to be keen to ‘explore other options’. Both players, whose contracts expire in June, have been subject of interest from other clubs. Watkins (pictured), who netted 10 times for the Reds this term, had his head turned by talk of Premier League interest in January and subsequently had a transfer request rejected. Ipswich Town saw a £1million bid turned down for the versatile forward last summer, with former boss Lee Johnson also keen to reignite their bond at Bristol City. Meanwhile, hometown club Swansea City have been linked with Watkins, with Leeds United, Aston Villa and Cardiff City also potential suitors. Scowen is reportedly high on Preston North End’s shopping list, with Ipswich, Sheffield Wednesday and Burnley also linked with the central midfielder. A club statement read: “Josh Scowen and Marley Watkins have been in discussions regarding new contracts. The club released their retained list yesterday and injury-stricken pair Aidy White and Ryan Williams are among a 10-name list of released players. Callum Evans, Lewin Nyatanga, Matty Templeton, James Carvell, Jake Charles, Jack Cowgill, Omari Patrick and George Proctor are the other players who have been released. Add to that the seven loanees - Adam Armstrong, Callum Elder, Gethin Jones, Julio Rodriguez, Matty James, Ryan Kent and Saidy Janko - returning to their parent clubs and the Reds are virtually starting from scratch. Head coach Paul Heckingbottom had already lost Sam Winnall, Conor Hourihane and James Bree back in January. And that means it will be a busy summer for Heckingbottom and co as they try to get much needed bodies through the door before the new season starts.